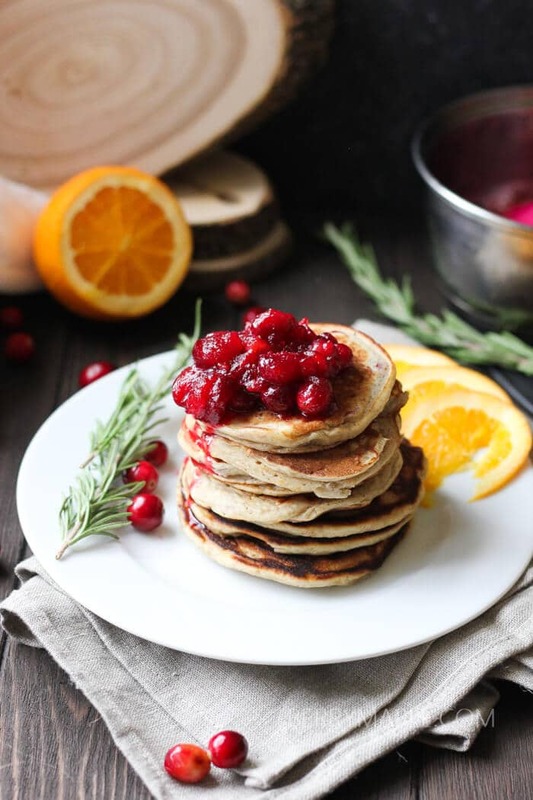 Fantastic combination of juicy orange, creamy ricotta and tart cranberries make this pancakes a perfect festive breakfast dish. 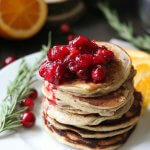 Do you like that incredible delicious smell of fresh pancakes? Holidays inspired me to add some orange zest to the ricotta cheese dough and it tasted so well and balanced together. And the smell of fresh cut oranges always reminds me of my childhood and cold winter months, when the snow is falling on the streets and its so warm and cozy home with parents. I added some orange zest here for a color too. My toddlers love to explore their food and cut it in little pieces before ready to put in the mouth. Oranges didn’t color whole pancakes but gave them an interesting orange tone with orange speckles. My kids loved that. Cranberry sauce. Very easy to make and great for breakfast too! When in season get a lot of fresh cranberries at your local store and freeze right in the bags( or wash and dry and then freeze). Make your own cranberry sauce all year around! Mix all the ingredients for the pancakes in the mixing bowl. Spray with oil spray your pancake pan. Cook pancakes , flipping on the other side once light brown. 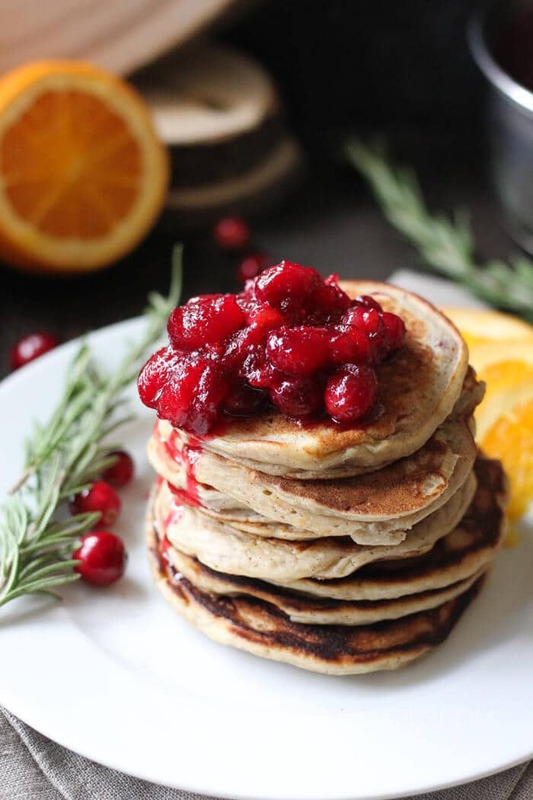 Stack pancakes and cover with cranberry sauce! I have never tried orange juice in the pancake dough.. and something tells me I am going to change that soon 🙂 these look delicious! That is a very inviting plate! 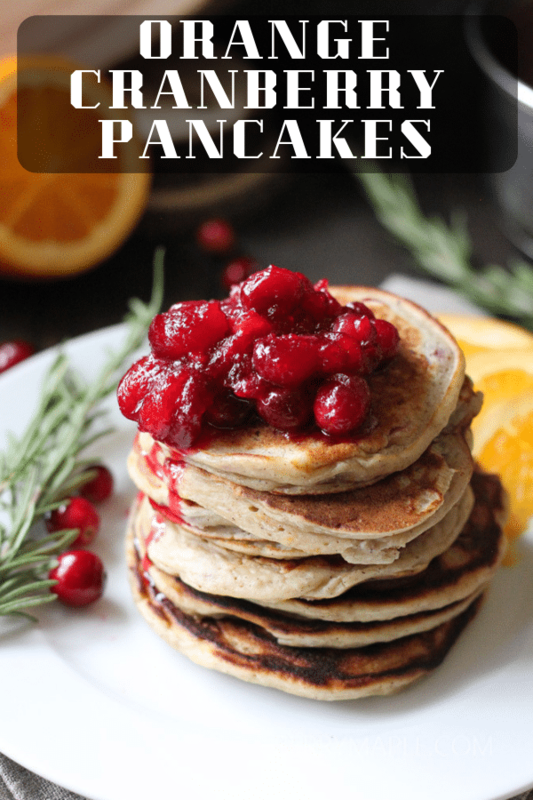 Gorgeous pancakes filled with holiday flavors are always a favorite in our house!